The Goldsmiths Centre Apprenticeships is the best place for you to learn your craft as a jeweller, silversmith or allied crafts person. Are you eager to begin your career but also want to continue your education by gaining professional qualifications? With The Goldsmiths Centre Apprenticeship you can get the best of both worlds by advancing your career and earning while learning. What do The Goldsmiths Centre Apprenticeships involve? The Goldsmiths Centre Apprenticeships involve a mixture of on the job training and off the job training which enables you to develop your knowledge while gaining invaluable work experience, highly sought skills and a nationally recognised qualification relevant to the industry you’re passionate about starting a career in. 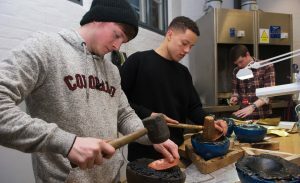 As an apprentice you’ll be employed directly by the Goldsmiths’ Company Assay Office or by a company under a Master, who is part of the Goldsmiths’ Company’s wider membership. They will pay you a salary and give you a contract of employment. During your Apprenticeship with The Goldsmiths Centre you could be working towards a Level 4 City & Guild’s Professional Recognition Award. Do you want to receive support and encouragement that will help you to reach your true potential? During your Apprenticeship you’ll advance your career while earning and learning and building your knowledge. Upon completion of your Apprenticeship with The Goldsmiths Centre you’ll open a wide range of progression opportunities. Future career opportunities include working for an international jewellery brand, small independent jewellers, go into self-employment or anywhere in-between. Are you ready to advance your career while earning and learning? Want to take your first step onto the career ladder while working towards a successful career in the industry?